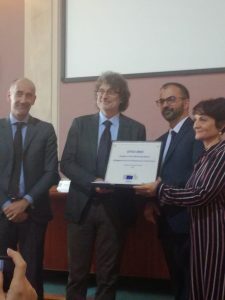 The European Commission granted the legal status of European Research Infrastructure Consortium (ERIC) to the European Plate Observing System (EPOS), a long-term plan to facilitate integrated use of data, data products, and facilities from distributed research infrastructures for solid Earth science in Europe. From lef to right: Dr Jean-Eric Paquet, general director for DGRI (EC), Dr. Massimo Cocco, EPOS coordinator, Prof. Lorenzo Fioramonti, deputy minister for science and education (Italy) and Dr. Carmela Freda, EPOS director. In practical terms, this EU measure provides the facility with a stable legal structure that brings also administrative advantages enjoyed by international organisations, thus contributing to the long-term sustainability of EPOS. Renowned European research institutions and universities are EPOS participants. As Portugal representative is C4G (Collaboratory for Geosciences), based at University of Beira Interior (UBI), and considered an FCT research infrastructure of the Portuguese strategic Roadmap. “C4G, as the national hub of EPOS, has access to extraordinary opportunities in research related to Solid Earth Sciences”, says Rui Fernandes, C4G President for the Coordinating Council and Executive Council and Coordinator of EPOS TCS (Thematic Core Services) GNSS Data and Products. As a research infrastructure, EPOS contributes for a better understanding of the physical processes controlling earthquakes, volcanic eruptions, tsunamis, tectonic movements and other such geo-hazards with potentially grave impact on the environment and the welfare of citizens. EPOS ERIC is the 20th European Research Infrastructure Consortium established and is the fifth ERIC in the environment sciences area. The legal status agreement was signed on November 7th, 2018. “Having C4G on behalf of Portugal in EPOS-ERIC is a major achievement”, says João Fonseca, national delegate of EPOS-ERIC and technical director of C4G. According to Fonseca, “in fact, it is an acknowledgement and an increase of brand awareness to all research institutions that form this consortium, now a reference as an FCT research infrastructure of the Portuguese strategic roadmap”. About EPOS – Based in Italy, EPOS was established by nine countries: Belgium, Denmark, France, Italy, the Netherlands, Norway, Portugal, Slovenia and the United Kingdom. Greece, Iceland and Switzerland will initially participate as observers. By linking up hundreds of individual research infrastructures located in the European countries, it will provide open access to a large pool of integrated data, data products and facilities for researchers. This entry was posted in Projects and tagged C4G, DGRI, EPOS, EPOS-ERIC, European Commission, GNSS products, João Fonseca, Rui Fernandes, technology as a service, UBI. Bookmark the permalink.